Although some are naturally more economical than others when it comes to managing storage space on their iPhone, iPad or iPod touch, I think most of us would agree that if we could top up our quota for a few extra songs, apps, games or video clips, we probably would. There are many different things to try when freeing up those precious few megabytes of space, and although manually sorting through each file and app would seem the most logical method, this is time consuming, and because we’re becoming less and less inclined to perform tasks manually, this is where iCleaner – a Cydia tweak developed by Exile.90 – becomes of relevance. Described as “the ultimate iPhone cleaning app,” you can either run it through a terminal app of your choosing, or simply tap on the home screen icon, although the latter does offer far less in terms of optimization. The app works like much CCleaner on Windows – it rids your device of unnecessary data – freeing it up for those extra music tracks, useful apps, or editions of Angry Birds. 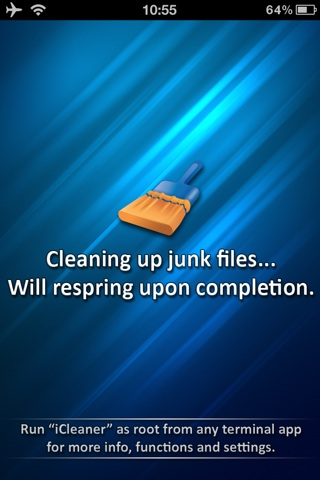 iCleaner will eradicate any half-downloaded Cydia packages (if you’ve had a few failures in your time, then there will surely be many loose files knocking around behind that brown icon), as well as much of the older cache files and cookies forming a plaque-like mass off needlessness within your Mobile Safari app. You can pick and choose which apps it cleans up (if you’re going down the Terminal route), and it’s advised you select those apps you visit the most, since they are the likeliest to hold excess data. So if you spend a lot of time on Twitter, Facebook, or indeed Instagram, then pointing iCleaner in their directions will likely yield higher space improvements once the process is complete. In some apps – particularly those such as Safari – you’ll probably want to pick and choose which aspects you want to remove as opposed to going in gung-ho, in which case you’ll need to download a terminal app from Cydia. For this purpose, we’d recommend MobileTerminal, and once you’ve downloaded it from Cydia, run it. Type in login root in order to gain root access, and then your password, which will be alpine by default. If you regularly SSH into your device, your root password should be altered to reduce your risk of somebody else obtaining access. To do so, type in “passwd” without the quotations, after which you’ll be prompted to type in and confirm a new password. To run iCleaner, simply type “iCleaner” (again, without the quote marks), and you’ll be met with a set of options. The first option will analyze your apps, the second will clean them up. On my iPhone 4S, it discovered 4295 files totaling 242 MB, and deleted them. Considering it’s the 64GB model, the space isn’t particularly significant, but to me, having too much space is better than having potential space cluttered by what is essentially junk. iCleaner is free, and available to download over at the BigBoss repository. My device is barely a month old, so some of you in ownership of your devices for a longer time will likely have much higher levels of unnecessary data, so give it a go and let us know how much space you saved by dropping us a comment via the usual mediums below!